Philly's Marge is the best thing we've figured out all week. Living in the suburbs of Chicago during the winter months can take quite a toll on you. Skies get gloomier, snow piles up on the ground, and temperatures dip to below freezing. Marge probably has a similar experience, being from Philadelphia, but their music sounds like it’s straight from an oceanside town in Southern California. Upon my first listen to their music, I felt like I was on a palm tree-lined beach and I was taken out of the dreary Chicago weather for a few minutes – I could almost smell the salty sea air. 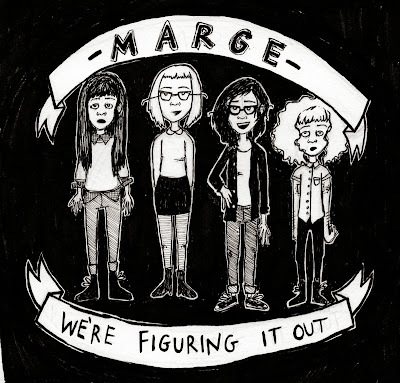 Marge’s Bandcamp page only features two songs along with a drawn image of four girls, which I can only assume these are the girls in Marge. Underneath the two-dimensional versions of the girls is a banner stating “Marge, We’re Figuring It Out”. As far as I can tell, Marge has quite a lot figured out. First song “will.i.am” contains a sweet melody and soft vocals from singers Eisenhower and Weiss. With a super catchy chorus and lovely harmonies, it’s definitely a song to put on a road trip mix. The second song, “Raincheck,” begins with a simple yet awesome riff and immediately kicks into a memorable melody. The lyrics suggest that the song's about a relationship gone wrong, so much that it gives the writer a headache that’s “tugging at her tendrils”. Marge has something in common with the other bands we've featured – anyone can relate to them. We’ve all had that awful relationship, be it romantic or friendly, that has gone wrong and has perhaps inspired a piece of art. Marge, don’t second guess yourself. You know what you’re doing. Listen to more Marge on bandcamp.